Foil Studio|Foil Studio for ribbon ～ gold lettering, silver lettering, design printers ～ metallic coloring, hologram foil | Seed Industrial Designing Co., Ltd.
Foil Studio for Ribbon is a printer that prints metallic foil on satin ribbons with heat transfer. Printed letters glimmer gently and are soft to the touch. Names or messages can be directly printed onto ribbon. 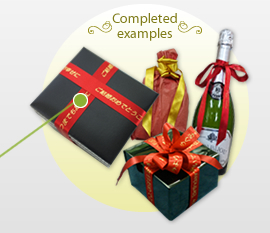 Print messages, logos or designs on ribbon(*) with metallic foil. Print with your favorite character style or design using the application software. Print only the quantity you need, anytime you want. 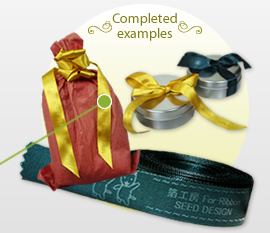 (*) We recommend SHINDO polyester satin ribbon. Contact us (info1@seed-design.co.jp) for details. Send us a sample, and we’ll do a test print. 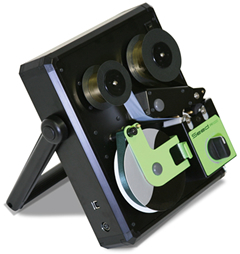 This portable model can handle both metallic foil and direct thermal printing. Why not send a gift with glittery message printed on ribbon with gold or silver lettering? With direct thermal printing, a method involving only heat transfer, messages or designs can also be printed on ribbon without foil. The stand for the machine can also be used as a handle for carrying. ＊The handle is moveable, and can be used as a handle when carrying around, or as a stand when set up for printing. on curved or spherical surfaces. 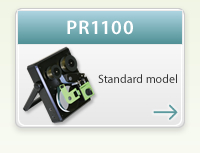 ＊Equipped with take-up reel for used ribbon. When a retransferable foil is set instead of satin ribbons, this printer can also produce transfer foils. 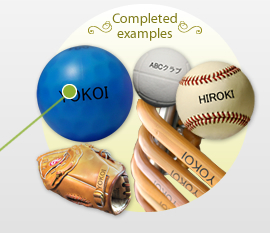 Images can be transferred onto curved or spherical surfaces such as golf clubs, rackets, or balls by using a hand heat roller (option) or a pad printer (option). Using direct thermal printing (print without foil), messages are printed weakly.